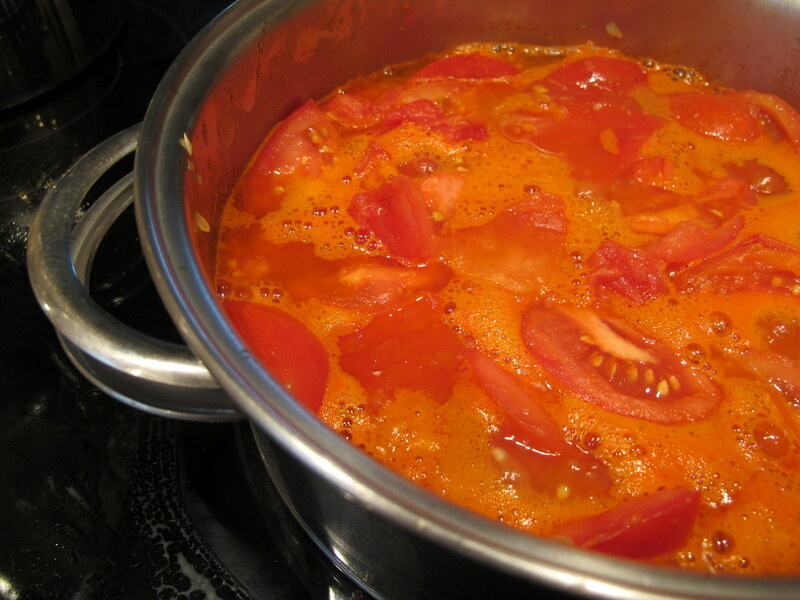 If you have tomatoes and don’t feel like canning, you must try this soup. Fresh tomato soup is unlike any tomato soup you’ve ever had. If you have an immersion blender, it’s a cinch to make. We get this treat only a couple times a year. It makes a perfect September supper with dipped bread, salad, and cheese. Large pinch oregano, marjoram, or basil. Fresh is nice too. Sauté onion and garlic in 3T olive oil in large, heavy pot. Cut unpeeled tomatoes into quarters, core, and add to pot. Simmer over med-low heat, stirring occasionally, until tomatoes are completely soft and swimming in their own juice (about 30 min). Remove from heat and puree with immersion blender, or, use a reg. blender in batches. Return to pot and season to taste with salt, pepper, and herbs. Simmer 10 more minutes, then stir in vinegar and remainder of olive oil before serving. You can drizzle more oil and vinegar over each bowlful, if you like. *Since I don’t have a kitchen scale, I have no idea what 5lbs of tomatoes looks like. I think I use about 10 beefsteaks for this recipe.